Sculpt-It is ideal for freehand modeling and creating realistic sculptures with no kiln or heat baking required. It dries to an almost ceramic hard surface with minimal shrinkage. 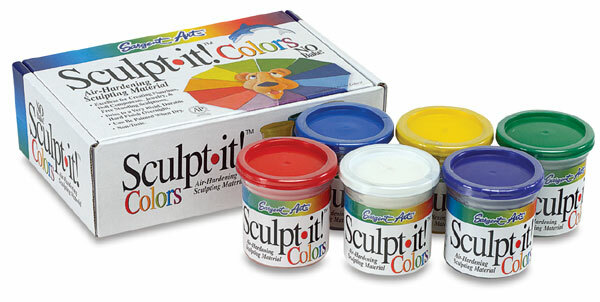 This 6-jar set of Sculpt-It colored sculpting material lets you do beautiful freehand modeling in color. Contains ¾ oz (21 g) jars of Yellow, Green, White, Red, Blue, and Purple. Colors can be blended together to create new colors or unique marbling effects.